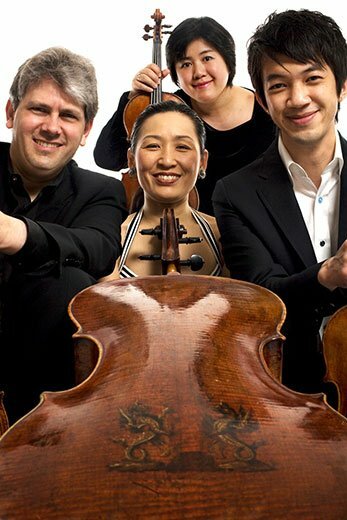 I was sick to death of Bach’s Goldberg Variations until hearing the Borromeo String Quartet’s magisterial take last night at Walnut Hills School as part of the Festival of Chinese Performing Arts. I have heard them played by two amazing harpists, on guitar, string trio, and, of course, harpsichord and piano. So, the prospect of hearing Nicholas Kitchen’s new arrangement had not provided any inducement to face a soaking lightning and thunderstorm, rather, Mendelssohn’s magical String Quartet No. 6, Op. 80 in F Minor attracted me. The well-attended concert began with a delicately sculpted reading of Schubert’s Quartettsatz in C Minor, D. 703, memorable for its haunting melodies and darkly dramatic harmonies and modulations. What a satisfying opener! The Borromeos closed with a staggering take on Mendelssohn’s sixth quartet, the last major piece he completed before he died two months later on November 4th, 1847. An homage to his sister Fanny, it bears the title “Requiem for Fanny.” Nothing could have prepared me for such intensity, passion, and excitement. Surely this Op. 80 is the Drama Queen of Quartets. Borromeo is embarking on a two-year cycle of Mendelssohn’s six Quartets at Gardner Museum. Last night’s evidence suggests that there’s no ensemble better suited to the task. I heard the same concert Monday night in Orleans. I was similarly blown away by the Goldbergs. It was such a pleasure to hear all the vocal lines which Kitchen has beautifully separated from the keyboard score. The different timbres and different locations on stage make them easily followed, and they are fascinating to hear. The balance between the players was excellent. Motobuchi was wonderful indeed, but it was also wonderful to hear Kristopher Tong’s superb playing, clear and in balance with the other players.